The PGA NZ pro am season for 2019 is now under way. Firstly, the qualifying school took place at the Pukekohe Golf Club, with 19 players attempting to gain Domestic Tournament Player Membership of the PGANZ. The top 5 players after 3 rounds earned membership and are now eligible to play NZ pro ams and Charles Tour events in 2019. Luke Kwon shot a second round 66 to take a healthy lead and never looked back, eventually heading the field by 3 shots. Jordan Loof and Mason Lee were very consistent over the 3 rounds, taking 2nd and 3rd spots respectively, while BK Sobhani and Corban Hill shared 4th place. Qualifying school medalist Luke Kwon has backed up his win with another at the first pro am of the year. 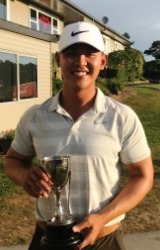 Kwon fired rounds of 67 68 for a 7 under par total and a 2 stroke win over Mark Brown. James Anstiss, Nick Coxon and Richard Lee finished a shot further back in a tie for third. Danny Lee was in Hawaii for the Sony Open. Lee posted 70 66 70 74 to make the cut but finish at the tail of the field in 71st. Ben Campbell kicks off his 2019 campaign at the Singapore Open, played, as usual, at the Sentosa Golf Club. As a winner on the 2018 season, Lydia Ko will take her place in the field at the inaugural Tournament of Champions in Lake Buena Vista, Orlando Forida. There is enough to keep the domestic Kiwi players busy this week. Friday and Saturday see events at Pukekohe Golf Club and Clarks Beach Golf Club, both sponsored by Lincoln Farms. Followed closely by the Harcourts Taupo Pro am on Sunday. Luke Kwon will be looking to continue his great form, but there are plenty of very good players on his heels aiming for a win early in the season.